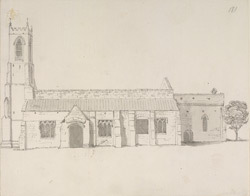 View of St Oswald's Church in Dunham-on-Trent. It has unusually large, impressive windows in the tower. They are in the Perpendicular Gothic-style and have four lights with elaborate decoration towards the top. The village of Dunham stands on the Nottinghamshire-side of the River Trent, facing Newton-on-Trent on the Lincolnshire side of the river.